L-Theanine, the active compound extracted from tea, Camellia sinensis, is a great non-dietary amino acid for promoting a calm, relaxed mood. It’s also a good supplement to help promote a focused mindset, and it may help to improve your memory and cognition when you use it with caffeine. People use L-Theanine for sleep due to it's relaxing effects. In this article, we’ll explore the top five ways that you can benefit from using L-Theanine. For more information about L-Theanine, take a read through our L-Theanine product description or our Ultimate Guide to L-Theanine. Researchers have shown that L-Theanine has the ability to help reduce feelings of stress and to help promote a calm and relaxed state of mind. Scientists recently found that using L-Theanine for stress is effective and results are seen in both psychological and physiological responses (lower blood pressure and heart rate in response to stress). Many people enjoy taking L-Theanine for studying. The anti-stress effects are great for just before exams and tests. L-Theanine may also help to improve cognition and memory, which is just what you need for studying. These effects are in addition to the focusing and calming effects that L-Theanine produces. L-Theanine for studying is especially effective when you combine the L-Theanine with caffeine. Researchers have conducted a number of studies that show the benefits of using L-Theanine and caffeine in exams. The improvements in exam performance were thought to be due to the focusing, energizing, and anti-stress effects of this dietary supplement combination. Another great way to use L-Theanine for sleep is to combine it with the great amino acid supplement, L-Tryptophan. L-Tryptophan is a great supplement for improving your mood. It gets converted into serotonin in your brain, which can then be used to make melatonin – the sleeping hormone. L-Tryptophan and L-Theanine for sleep is a highly effective supplement stack! L-Theanine is also often used to improve energy and focus. Although it is not a stimulant – meaning it is not known for its great energy boost – a number of users report a noticeable increase in energy when taking L-Theanine supplements. Another great thing is that using L-Theanine for sleep helps to improve your energy levels the next day. The best way to improve your energy and focus with L-Theanine is to combine it with caffeine. 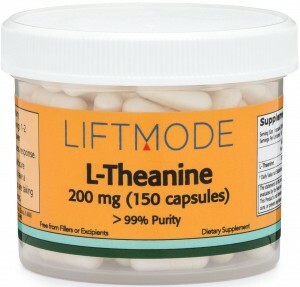 Researchers and users alike have indicated that L-Theanine with caffeine increases mental clarity, focus, and energy. This is a great stack for anyone looking to boost their mental alertness and energy levels – students, professionals, and athletes come to mind as three groups of people who would benefit greatly. Some people use L-Theanine supplements for promoting healthy weight. At this point, there is not much evidence showing that L-Theanine is effective at helping your body to maintain a healthy weight. However, at least one study indicated that L-Theanine may have the potential to help reduce blood pressure increases related to stress. High blood pressure is a common indicator of being overweight and has been linked to weight gain. Furthermore, a number of animal studies have indicated the potential use of L-Theanine for maintaining a healthy weight. Animal studies often have unrelated results when studied in humans, so these should always be taken with a pinch of salt. The best option for maintaining a healthy weight is always a healthy diet that is high in fruit and vegetables and low in animal fat and processed goods. This along with a healthy lifestyle ensures a healthy weight. If you are interested in how sleep can affect your weight, take a read through our new Biohacking article! In summary, people tend to use L-Theanine for a number of great benefits. One of the top benefits is using L-Theanine for sleep. This wonderful supplement helps to reduce feelings of stress and to promote a calm, relaxed state of mind. It is the active component of tea, which has always been known to have calming effects. Furthermore, L-Theanine is great for boosting cognitive performance and mental focus, especially if you combine it with caffeine. It may have the potential to help maintain a healthy weight but more studies are needed. The effects of L-theanine (Suntheanine®) on objective sleep quality in boys with attention deficit hyperactivity disorder (ADHD): a randomized, double-blind, placebo-controlled clinical trial, MR Lyon et al., Altern Med Rev. 2011 Dec;16(4):348-54. Effects of L-tryptophan on sleepiness and on sleep, E Hartmann, J Psychiatr Res. 1982-1983;17(2):107-13. Effects of L-theanine or caffeine intake on changes in blood pressure under physical and psychological stresses, A Yoto et al., J Physiol Anthropol. 2012; 31(1): 28, Published online 2012 Oct 29. Anti-obesity effects of three major components of green tea, catechins, caffeine and theanine, in mice, G Zheng et al., In Vivo. 2004 Jan-Feb;18(1):55-62.